It helps relieve heartburn, persistent cough and difficulty swallowing. It heals the damage caused by the acid in the esophagus and stomach. It also helps prevent cancer of the esophagus. Pantoprazole is FDA approved since 2000. It is in the same class of drug as Omeprazole, Rabeprazole and Lansoprazole. It works by blocking the enzyme in the walls of the stomach that produces acid. Blocking the enzyme decreases the production of acid allowing the esophagus and the stomach to heal. 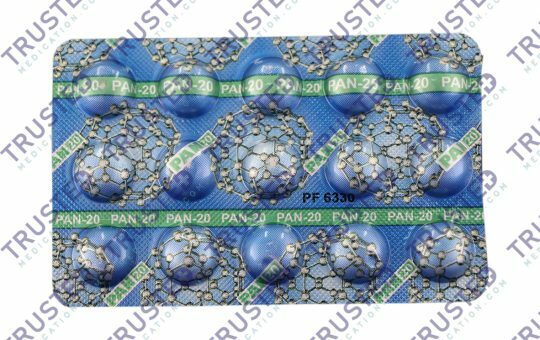 Pantoprazole comes in a tablet and oral suspension granules that you need to take orally. Take this drug as directed by your physician. The recommended dose for the treatment of GERD and erosive esophagitis in an adult is 40 mg a day for 4 to 8 weeks. Children 5 years of age and older and who weight 40 kg or more, take 40 mg a day for 8 weeks. The dose for Zollinger-Ellison syndrome is 40 mg twice a day. Take the medication 30 minutes before a meal for the best possible effect. Swallow the tablet whole. Do not crush or chew the tablet. For the oral suspension granules, mix the content in applesauce. Swallow the mixture 30 minutes before a meal. Do not mix it with other liquid except for applesauce and apple juice. Do not divide the content to make smaller doses. Continue taking this medication even if you feel well. Buy Pantoprazole. Get medical help right away in case of serious side effects. This medication may increase your risk of having Clostridium difficile infection. Patients who have been using this treatment for a prolonged period of time have a higher risk of osteoporosis. Prolonged use may also reduce your ability to absorb vitamin B12. This drug is less likely to interact with other PPI. Patients with heart problems must use this medication with care. Long-term use of this medication may increase your risk of heart attack.